To become the first school district to operate 100 percent of their school buses on propane autogas. Almost $6,500 in fuel savings per bus, per year, with expected savings of $4.43 million over five years. 82 percent fuel savings per gallon when compared to diesel. More than 62,500 pounds of greenhouse gases per bus, per year, eliminated from Mesa’s carbon footprint. 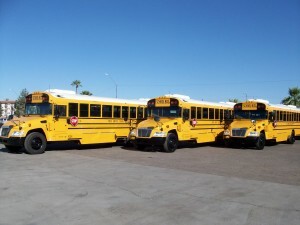 Operating the largest school bus fleet in the state with 517 school buses, Mesa has been saving ‘green’ both on paper and in the environment since October 2011 when they incorporated their first 21 Blue Bird Micro Bird G5 Type A school buses fueled by propane autogas. 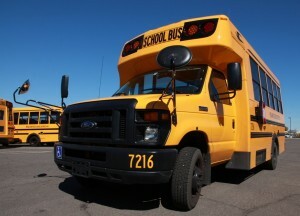 Since then, Mesa has purchased 68 Blue Bird Propane-Powered Visions, the only Type C 77-passenger school bus to operate on this alternative fuel. These buses travel 15,506 route miles per school year and transport thousands of students each day. Changes in federal emissions regulations first prompted Mesa school officials to consider alternatives to diesel in their fleet. Children are among those most susceptible to the health effects of exhaust exposure as a result of their developing body and lungs and faster breathing rates than adults. Mesa tested compressed natural gas buses and considered hybrids, but found that the operation and costs didn’t meet the district’s requirements. Latko began to search for other clean and domestic fuel alternatives to transport their precious cargo. Each year, Mesa purchases school buses to replace their retiring ones. In 2009, Latko recommended to Mesa’s governing board that they “double up” on bus purchases, with no additional acquisitions for the following year. The decision saved money while giving them time to learn what other school districts were doing to accommodate the new federal emissions standards, set to go into effect in 2010. During his research, Latko read about ThyssenKrupp Elevator’s “Five C’s” approach to identifying a viable alternative fuel, which Latko and his team used in their analysis. He discovered that other school districts fueled with propane autogas — some for as long as 30 years. “After finding school districts across the country — from Texas to Los Angeles to Oregon — successfully switching their school buses to run on propane autogas, we knew it could work for Mesa, too,” said Latko. With the assistance of their Blue Bird dealer, Canyon State Bus Sales, Mesa arranged for a propane autogas bus to be test driven by their district’s technicians. Latko and his team then developed a savings calculator to see if making the switch to propane autogas was affordable. Right away, the team discovered the district would save $2.91 per gallon compared to their diesel fuel cost — $6,446 savings per bus each year. Factoring in lower maintenance costs due to the clean-burning properties of autogas, the potential for longer engine life, and that no pilfering or spillage of the fuel could occur, Latko estimated an additional $4,000 savings over the lifetime of each bus. Latko went even further, accounting for the idling of the buses, too. Latko didn’t begin the process of finding the perfect alternative fuel solution thinking he’d make history. But history he made, with Mesa being the first school system in the state to adopt propane autogas school buses. Propane autogas is the leading alternative fuel in the United States with about 150,000 on-road vehicles, and the third most commonly used vehicle fuel in the world, following gasoline and diesel. It’s also a domestic fuel, with 91 percent of propane supplies from U.S. production and another seven percent from Canada. Mesa keeps each school bus an average of 13 years, with a total of 200,000 miles over the course of its operation life. Latko expects the district to get an average of five additional years from their propane autogas buses due to cleaner-burning properties of the fuel through the engine. Their current fleet will reduce greenhouse gases by 2,789 tons each year compared to their former conventional diesel buses. With significantly fewer emissions leaving the tailpipe, fueling with propane autogas reduces short-term and long-term health effects in passengers. For heavier-duty engines using propane autogas, nitrogen oxide, carbon monoxide and total hydrocarbons are all reduced, and particulate matter is virtually eliminated, when compared to conventional diesel. While thousands of propane autogas refueling stations across the country make this domestic alternative readily available, when it came to refueling options, Mesa opted for a private infrastructure. After a thorough RFP process, the district chose Ferrellgas to install an 18,000-gallon onsite, in-ground propane autogas station in their largest satellite location. Another 18,000-gallon station has since been installed at a second satellite office and a 1,000-gallon tank at a third location. The speed and ease of propane refueling is comparable to that of gasoline and diesel. Propane autogas refueling consists of a closed system, which eliminates fuel spillage and groundwater contamination risks, making on-site refueling much easier to integrate than conventional fuels like gasoline or diesel. The district chose Canyon State Bus Sales because they could purchase the propane autogas models directly from the dealership with full warranties in place, a key component in their decision-making process. In fact, the alternative fuel buses have performed so well, Mesa has been running them overtime for transportation to and from extracurricular activities. And with a 50 percent noise reduction when compared to diesel, “the drivers are thrilled with the propane models,” says Latko. In addition to running all propane in their bus fleet, Mesa is interested in purchasing propane autogas vehicles for their white fleet, too. The schools’ employees use an additional 600 vehicles for maintenance, custodial and information services. The school district runs one Ford ROUSH CleanTech F-250 propane autogas pickup truck already, with plans to purchase more in the future. An unexpected side effect of Mesa’s Propane-Powered Vision and Micro Bird buses has been increased publicity for the school district and speaking opportunities for Latko. The district has received media coverage on local television news stations and in national trade journals for their environmental effort. Latko has presented at school bus stakeholder summits and his state’s school business association. Plus, the school system was recognized by the State of Arizona as a Clean Air Energy recipient. “We want to show the parents and residents in our community that we are doing everything we can to be fiscally and environmentally responsible,” says Latko, a recipient of the 2012 Green Fleet magazine Sustainable All-Stars award. About Blue Bird: Blue Bird offers a complete line of Type A, C and D school buses in a variety of options and configurations. For 85 years Blue Bird Corporation has continued to set industry standards with its innovative design and manufacturing capabilities. Today, Blue Bird has more than 1,500 employees, Georgia-based manufacturing facilities and an extensive network of dealers and service-parts facilities throughout North America. Additionally, Blue Bird provides comprehensive financial solutions through Blue Bird Capital Services. Its global presence can be seen in more than 60 countries through sales into Africa, Asia, the Caribbean, Latin America, Europe and the Middle East. For more information, visit the Blue Bird Corporation web site at www.blue-bird.com.